Luminous fiddler, Mariel Vandersteel will be joining our merry band of wintery songs performers this year! 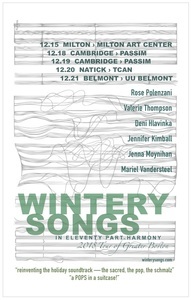 Not only does she teach fiddle at Passim, but she is an accomplished graphic designer and was a founging member of Laura Cortese and the Dance Cards. Here she is playing Hardanger fiddle at Celtic Connections, 2012 with Hannah Read, who will also be part of Wintery Songs this year!